The new point-to-point hybrid IP/ASI microwave radios and 58microLite HD Mini Kit are going to be featured by Integrated Microwave at NAB New York 2016 at their booth 1650. The Nulinx-IP is a point-to-point bi-directional microwave link that brings the high reliability and scalability of carrier-grade microwave to broadcasters. The Nulinx-IP supports data rates as high as 600 Mbps in a 30 MHz Part 101 channel using a single set of antennas, and as high as 1200 Mbps using MIMO technology. The product operates with as little as 75 MHz transmit/receive frequency spacing and can use traditional Part 74 (BAS) and Part 101 (Fixed Microwave Service) microwave channels. 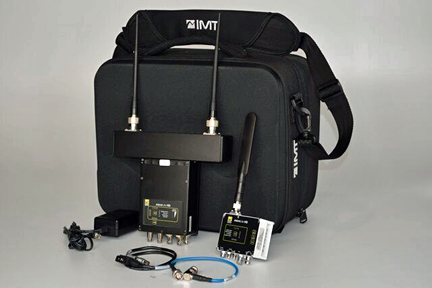 Available as an all-indoor or split system on any licensed or unlicensed band from 5.8 through 42 GHz, IMT’s Nulinx-IP Flex has the flexibility and expandability to grow with the user’s needs. As auxiliary spectrum becomes increasingly scarce, making maximum use of available channel space is essential. The Nulinx-IP Flex offers adaptive modulation constellations up to 2048 QAM, so more bits move in the same amount of spectrum. Adaptive modulation nearly eliminates outages when atmospheric conditions, such as heavy rain, do not support the highest data rates. Advanced Quality of Service (QoS) controls ensure that essential program traffic continues to flow. Header deduplication and other built-in data compression techniques offer greater throughput in the same spectrum space. Created to improve operational efficiencies for daily news applications, the 58microLite HD Mini Kit is a highly portable professional-grade HD wireless camera link capable of providing high-quality video at distances over two miles, line-of-sight (LOS). This latest version of the microLite system is the perfect accessory to any remote news production with its reduced deployment time and improved agility. At the heart of the 58microLite HD Mini Kit is the microLite HD Transmitter. The 58microLite kit also features a dual-diversity COFDM receiver that uses maximal-ratio combining technology to enable the system to support LOS as well as non-line-of-sight (NLOS) applications. It comes in an ultra-small, self-contained package perfect for discrete installations. The 58microLite HD Mini Kit comes in three camera mounting versions: the standard hot-shoe and optional Anton/Bauer Gold Mount or V-Mount. Integrated Microwave Technologies (IMT) is a business unit of xG Technology, Inc.
Additional information may be found at www.imt-solutions.com and www.xgtechnology.com.